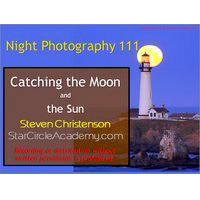 In this 110 minute Webinar, you will be introduced to several free (and almost free) tools that you can use to plan a moon (or sun) shot - including a tool written by Steven and made available only to attendees. 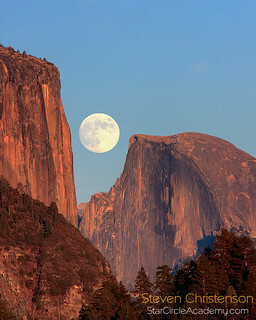 Have you wanted to capture the moon "right where you want it" but weren't sure how? If you know you could resort to photo editing and fake it but you'd rather get the real deal then this class is for you. 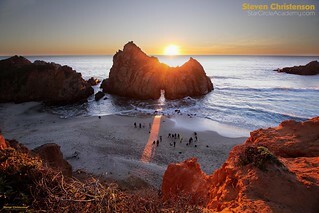 Steven will demonstrate how to determine when and where to go to capture an image like the Moon over Lick Observatory or the moon at the Transamerica Building or the sun shining through a portal in the Pacific Ocean (below). This is a Webinar so you can conveniently attend from your computer at work or home anywhere in the world. This course includes notes, access to a private page with details - including landmark events Steven has already solved for you, an online viewable recorded webinar with unlimited online viewing that you can watch NOW before the webinar is held. One indispensable tool covered in detail is the Photographer's Ephemeris by Stephen Trainor. 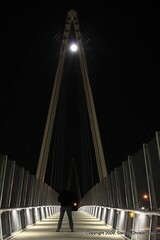 How to Plan a moon or solar "contact" shot. What camera settings you need to get it all exposed just right. Remember that this event INCLUDEs online videos, notes, and access to a special tool that Steven uses to solve lunar and solar contact shots. Please refer to the IMPORTANT INFORMATION page before signing up for access. Yes. A recording of a prior webinar is included. Notes are included! There is also access to a private web page.